Santa Teresa Art Discovery Visit to Escadaria Selarón, Rio de Janeiro, Brazil. Photo: A/Prof Masa Noguchi. The Brazil Travelling studio was first run in 2015 at the Melbourne School of Design, and is operated in partnership with the Federal University of Parana, University of Sao Paulo and the State University of Londrina. The aim of the studio is to explore design and construction approaches that can be applied to low cost social housing developments in Brazil. A major focus of this studio is the ZEMCH movement. ZEMCH –‘Zero Energy Mass Custom Home’ – reflects a global demand for sustainable housing development. ZEMCH also prioritises the customisability of housing, where affordable dwellings are designed to accommodate individual occupants’ various needs and demands over the period of their lifespan, a focus which has traditionally been sidelined in the mass-produced home industry. Sustainability embraces housing economy and adequacy beyond the legitimacy in which the quality barely coincides with individuals' various needs, desires and expectations. In response to growing global warming and the constant increase of energy prices, low cost housing in Brazil needs to be designed, constructed and operated more responsibly to secure low to zero energy use. Following several study tours of Japan, where participants observed the state-of-the-art production and sales facilities of leading low to zero energy or carbon dioxide emission sustainable housing manufacturers, Associate Professor Masa Noguchi helped establish an international ZEMCH Network, based at the Melbourne School of Design. The travelling studio benefits both the local community and participating MSD students. It allows students to gain hands-on experience with complex, real-life issues relating to design thought and production. This experience proved invaluable to participants. Vivian Tan, who studied the subject this semester, relished the opportunity to apply her theoretical knowledge to a practical, real-life situation. Tan comes from a background in urban planning and geography, and has focused her studies on policy and social justice. “I want to use my knowledge to help deliver something that’s on the ground instead of just talking about it and talking about the issues that we face; actually doing something.” The Brazil TS afforded her exactly that opportunity. “This was definitely the most rewarding part” she reflects. There were many cultural differences that stood out in relation to design and construction. In some instances, the students were told that their ideas would not work, and would not be accepted by the people they were designing for. “The community didn’t like our initial design for a shallow sloped roof – this aesthetic was associated with factories – the community would only accept the traditional pitched roof which they associated more with a home”, recalls Vivian. Similarly, no one wanted street facing front doors, they had to be on a side angle, and people preferred their clotheslines to be in the kitchen rather than outside, for fear of theft. Locally sourced materials were also an important priority for the community. “These were all different concerns that initially didn’t occur to us, so having local input helped us to hone in on a particular approach to our design that was more familiar and acceptable to the local community,” explains Dimitrios. 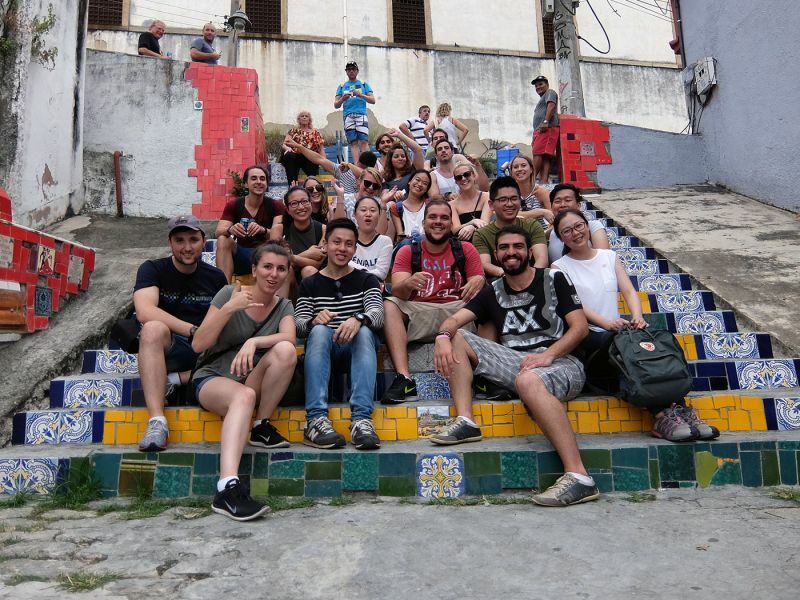 As part of the studio, students visited the Favelas to see how ZEMCH technology could improve the housing situation for communities in the lower socio-economic sector. One thing that struck both Vivian and Dimitrios was the sense of community present in the Favelas, and how important it was for this to be retained in any community housing development project. They, through their projects, aimed to create a safer, more sustainable and more inclusive alternative to the Favelas, without losing the sense of community. Students found that the ZEMCH approach provided a great solution to the housing issues faced by the lower socio-economic sector. They were able to apply ZEMCH principles based on client feedback. Both Vivian and Dimitrios highly recommend the Travelling Studio experience to anyone considering it. The Travelling Studio enabled its student participants to turn theory into practice, experience a different culture first hand and use their design skills to positively influence a local community. The experience appears to be a winning situation for all involved. “Just do it” advises Vivian, “you learn so much more in that context as opposed to just sitting in a lecture and a tutorial where you only discuss the Australian context. It’s good to get out there and work with different people from all over the world because it opens your eyes and makes you someone who can adapt to the local context."